Reading and share top 81 famous quotes and sayings about Youth And Love by famous authors and people. 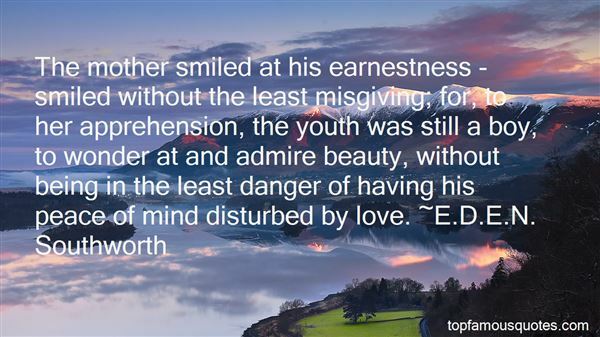 Browse top 81 famous quotes and sayings about Youth And Love by most favorite authors. 1. "(To The Youth) "...you know and everybody knows that life has failed to bring the light of hope to my eyes, draw a smile on my face, and create joy in my heart. You know and everybody knows that being tortured for you, being imprisoned for you and suffering for your sake has been the only joy I have ever had..... it is from your joy that I feel comfort, it is your freedom that brings the light of hope to my sight, it is your comfort that I feel relaxed in my heart.... I cannot speak well or write well... please note the hidden force under my simple lousy words.. please understand... please understand ! I love you and consider you my only friend; all my life, all the days and nights, every moment of my life is a witness to my love and dedication for you. Your freedom is my doctrine, your success is my affection, your future is my only hope!" 2. "I am sitting far from youA thousand miles away from youI sit and write for youA thousand lines I write for youA thousand times I write for you.If love could reach youThousand miles awayI would say it thenI love you – a thousand times.I will come againMuch closer than beforeBut I won't say it thenFor I will fall in loveA thousand times more.It's better to restrainUntil its time for the planeI will say it thenI love you a thousand timesA thousand miles away.With every mile I go awayI love you even moreSo please stay awayA thousand miles more"
3. "But how am I to get over the ten or twelve days that must yet elapse before they go? Yet why so long for their departure? When they are gone how shall I get through the months or years of my future life, in company with that man -- my greatest enemy -- for none could injure me as he has done? Oh! when I think how fondly, how foolishly I have loved him, how madly I have trusted him, how constantly I have laboured, and studied, and prayed, and struggled for his advantage, and how cruelly he has trampled on my love, betrayed my trust, scorned my prayers and tears, and efforts for his preservation --crushed my hopes, destroyed my youth's best feelings, and doomed me to a life of hopeless misery -- as far as man can do it -- it is not enough to say that I no longer love my husband -- I HATE him! The word stares me in the face like a guilty confession, but it is true: I hate him -- I hate him! -- but God have mercy on his miserable soul!" 4. "In his youth, he was electrified. The stars were moving in his bloodstream. He would not have been cowed by the customs of an earthly monarch. When he loved, it was with a heat and a desperation that he carried like a sword. He loved in the way that Greeks burned cities." 5. "Anyway, those things would not have lasted long.The experience of the years shows it to me.But Destiny arrived in some haste and stopped them.The beautiful life was brief.But how potent were the perfumes,On how splendid a bed we lay,To what sensual delight we gave our bodies.An echo of the days of pleasure,An echo of the days drew near me,A little of the fire of the youth of both of us,Again I took in my hands a letter,And I read and reread till the light was gone.And melancholy, I came out on the balconyCame out to change my thoughts at least by looking atA little of the city that I loved,A little movement on the street and in the shops.Translated by Rae Dalven"
6. "After a youth and manhood passed half in unutterable misery and half in dreary solitude, I have for the first time found what I can truly love--I have found you." 7. "The mother smiled at his earnestness - smiled without the least misgiving; for, to her apprehension, the youth was still a boy, to wonder at and admire beauty, without being in the least danger of having his peace of mind disturbed by love." 8. "THE LAKEIn spring of youth it was my lotTo haunt of the wide world a spotThe which I could not love the less-So lovely was the lonelinessOf a wild lake, with black rock bound,And the tall pines that towered around.But when the Night had thrown her pallUpon that spot, as upon all,And the mystic wind went byMurmuring in melody-Then-ah then I would awakeTo the terror of the lone lake.Yet that terror was not fright,But a tremulous delight-A feeling not the jewelled mineCould teach or bribe me to define-Nor Love-although the Love were thine.Death was in that poisonous wave,And in its gulf a fitting graveFor him who thence could solace bringTo his lone imagining-Whose solitary soul could makeAn Eden of that dim lake." 9. "They had created themselves together, and they always saw themselves, their youth, their love, their lost youth and lost love, their failures and memories, as a sort of living fiction." 10. "? "All that history, the love & laughter, is designed for youth. It is what keeps the story of who we are alive from one generation to the next. It ensures our indelible mark in the souls of generations we will never have the pleasure of holding in a warm embrace. Life is short people. Before you know it, another decade will pass, people you love will be lost to this world, and all that will be left of them is what we carry in our hearts." Elsie Love 2011"
11. "And what about ageing? Do men force the fear of ageing upon us -- or are we ourselves terrified because we only know one kind of power -- the power of youthful beauty?Isn't it possible that if we became comfortable with other forms of female power, men might too? In her wonderful futurist novel, He, She, and It, Marge Piercy imagines a cyborg who is taught to love the bodies of older women. A delicious proposal -- because it tells that whatever we may imagine can come true. Women often hate their own bodies. Sometimes I think that the most important things about having at least one relationship with someone of your own gender -- especially if you are a woman -- is to confront the female self-hatred and turn it into self-love." 12. "We are not youth any longer. We don't want to take the world by storm. We are fleeing. We fly from ourselves. From our life. We were eighteen and had begun to love life and the world; and we had to shoot it to pieces." 13. "And even if these scenes from our youth were given back to us we would hardly know what to do. The tender, secret influence that passed from them into us could not rise again. We might be amongst them and move in them; we might remember and love them and be stirred by the sight of them. But it would be like gazing at the photograph of a dead comrade; those are his features, it is his face, and the days we spent together take on a mournful life in the memory; but the man himself it is not." 14. "As he put in his studs he realized that he was enjoying life as he would probably never enjoy it again. Everything was hallowed by the haze of his own youth. He had arrived, abreast of the best in his generation at Princeton. He was in love and his love was returned." 15. "Amory, sorry for them, was still not sorry for himself - art, politics, religion, whatever his medium should be, he knew he was safe now, free from all hysteria - he could accept what was acceptable, roam, grow, rebel, sleep deep through many nights...There was no God in his heart, he knew; his ideas were still in riot; there was ever the pain of memory; the regret for his lost youth - yet the waters of disillusion had left a deposit on his soul, responsibility and a love of life, the faint stirring of old ambitions and unrealized dreams...And he could not tell why the struggle was worth while, why he had determined to use to the utmost himself and his heritage from the personalities he had passed...He stretched out his arms to the crystalline, radiant sky. "I know myself," he cried, "but that is all." 16. "That 'creature,' that 'woman of loose behaviour' is perhaps holier than you are yourselves, you monks who are seeking salvation! She fell perhaps in her youth, ruined by her environment. But she loved much and Christ himself forgave the woman 'who loved much." 17. "Author describes one character's optimism as, that quiet well-being which perhaps you and I have felt on a sunny afternoon when, in our brightest youth and health, life has opened a new vista for us, and long to-morrows of activity have stretched before us like a lovely plain which there was no need for hurrying to look at, because it was all our own." 18. "If a continental youth wants to declare his love to a girl, he kneels down, tells her that she is the sweetest, the most charming and ravishing person in the world, that she has something in her, something peculiar and individual which only a few hundred thousand other women have and that he would be unable to live one more minute without her. Often, to give a little more emphasis to the statement, he shoots himself on the spot. This is a normal, week-day declaration of love in the more temperamental continental countries. In England the boy pats his adored one on the back and says softly: ‘I don't object to you, you know.' If he is quite mad with passion, he may add: ‘I rather fancy you, in fact." 19. "I told her that I'd done things in my youth that had placed me beyond the comfort and shelter of love, and so i had conducted my life in retreat." 20. "Is love a fancy, or a feeling? No.It is immortal as immaculate Truth,'Tis not a blossom shed as soon as youth,Drops from the stem of life--for it will grow,In barren regions, where no waters flow,Nor rays of promise cheats the pensive gloom.A darkling fire, faint hovering o'er a tomb,That but itself and darkness nought doth show,It is my love's being yet it cannot die,Nor will it change, though all be changed beside;Though fairest beauty be no longer fair,Though vows be false, and faith itself deny,Though sharp enjoyment be a suicide,And hope a spectre in a ruin bare." 21. "I used to love youI still doSo SelfishI love the old youThe you that didnt shoot drugs...The you that didnt get beat on by menYou laugh in my face and call me a foolBut its trueI still love youSometimes,I can see the old youWhen your eyes flashWhen you almost look alive"
22. "This Christmas mend a quarrel. Seek out a forgotten friend. Dismiss suspicion and replace it with trust. Write a letter. Give a soft answer. Encourage youth. Manifest your loyalty in word and deed. Keep a promise. Forgo a grudge. Forgive an enemy. Apologize. Try to understand. Examine your demands on others. Think first of someone else. Be kind. Be gentle. Laugh a little more. Express your gratitude. Welcome a stranger. Gladden the heart of a child. Take pleasure in the beauty and wonder of the earth. Speak your love, and then speak it again." 23. 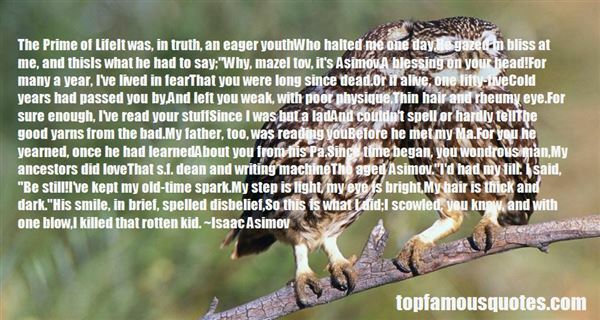 "The Prime of LifeIt was, in truth, an eager youthWho halted me one day.He gazed in bliss at me, and thisIs what he had to say;"Why, mazel tov, it's Asimov,A blessing on your head!For many a year, I've lived in fearThat you were long since dead.Or if alive, one fifty-fiveCold years had passed you by,And left you weak, with poor physique,Thin hair and rheumy eye.For sure enough, I've read your stuffSince I was but a ladAnd couldn't spell or hardly tellThe good yarns from the bad.My father, too, was reading youBefore he met my Ma.For you he yearned, once he had learnedAbout you from his Pa.Since time began, you wondrous man,My ancestors did loveThat s.f. dean and writing machineThe aged Asimov. "I'd had my fill. I said, "Be still!I've kept my old-time spark.My step is light, my eye is bright,My hair is thick and dark. "His smile, in brief, spelled disbelief,So this is what I did;I scowled, you know, and with one blow,I killed that rotten kid." 24. "An abyss of fortune or of temperament sundered him from them. His mind seemed older than theirs: it shone coldly on their strifes and happiness and regrets like a moon upon a younger earth. No life or youth stirred in him as it had stirred in them. He had known neither the pleasure of companionship with others nor the vigour of rude male health nor filial piety. Nothing stirred within his soul but a cold and cruel and loveless lust. His childhood was dead or lost and with it his soul capable of simple joys and he was drifting amid life like the barren shell of the moon." 25. "Miss Bates…had never boasted either beauty or cleverness. Her youth had passed without distinction, and her middle of life was devoted to the care of a failing mother, and the endeavour to make a small income go as far as possible. And yet she was a happy woman, and a woman whom no one named without good-will. It was her own universal goodwill and contented temper which worked such wonders. She loved every body, was interested in every body's happiness and quick-sighted to every body's merits; thought herself a most fortunate creature, and surrounded with blessings in such an excellent mother and so many good neighbours and friends, and a home that wanted for nothing. The simplicity and cheerfulness of her nature, her contented and grateful spirit, were a recommendation to every body and a mine of felicity to herself." 26. "Chaos, I think, is youth. Youth at any age. Because as long as you have chaos, you are free of responsibility. When you are in chaos, when you don't know what's going on, when you're an ignorant dreamer...when you're floating through space like that, you aren't supposed to get anything right, you aren't supposed to make sense, you're supposed to be...amused,,,and aware. It can't go on. Not unless you choose that life. A life of never settling down, never making a claim on who you are, who you love... Once you make those claims you become accountable. You have to get to work...Dreams end. That's one thing I'm discovering." 27. "I would very much like to make Westerns. I love Westerns. I've worked on many Westerns in my youth, in Spain and here, and I love working on them." 28. "[Jürgen Habermas' obituary to friend and philosopher, Richard Rorty]One small autobiographical piece by Rorty bears the title 'Wild Orchids and Trotsky.' In it, Rorty describes how as a youth he ambled around the blooming hillside in north-west New Jersey, and breathed in the stunning odour of the orchids. Around the same time he discovered a fascinating book at the home of his leftist parents, defending Leon Trotsky against Stalin. This was the origin of the vision that the young Rorty took with him to college: philosophy is there to reconcile the celestial beauty of orchids with Trotsky's dream of justice on earth. Nothing is sacred to Rorty the ironist. Asked at the end of his life about the 'holy', the strict atheist answered with words reminiscent of the young Hegel: 'My sense of the holy is bound up with the hope that some day my remote descendants will live in a global civilization in which love is pretty much the only law." 29. "You ask me how I became a madman. It happened thus: One day, long before many gods were born, I woke from a deep sleep and found all my masks were stolen, the seven masks I have fashioned an worn in seven lives, I ran maskless through the crowded streets shouting, "Thieves, thieves, the cursed thieves." Men and women laughed at me and some ran to their houses in fear of me. And when I reached the market place, a youth standing on a house-top cried, "He is a madman." I looked up to behold him; the sun kissed my own naked face for the first time. For the first time the sun kissed my own naked face and my soul was inflamed with love for the sun, and I wanted my masks no more. And as if in a trance I cried, "Blessed, blessed are the thieves who stole my masks." Thus I became a madman." 30. "Royal Young has accomplished a rare feat in his fresh and riveting debut: he manages to recount his fascinating youth and unconventional family with a mixture of humor, scathing honesty and tenderness. Much more than simply a book about a kid who dreams of stardom, Fame Shark is a thoughtful, hilarious and moving love letter to his family and the Lower East Side of New York City." 31. "She was willing to give you everything she had. And you took it from her. You took her youth, and her beauty, and her energy and her health-" For a moment, think of his mother, Gabe couldn't continue speaking. He fell silent and choked back tears. Then he took a deep breath and went on, "- and it didn't matter. We found each other. None of it mattered but that. You won't ever know what that's like, to love someone. In a way, I pity you. But I hope you starve." 32. "Imagine the terrestrial timespan as an outstretched arm: a single swipe of an emery-board, across the nail of the third finger, erases human history. We haven't been around for very long. And we've turned the earth's hair white. Sh e seemed to have eternal youth but now she's ageing awful fast, like an addict, like a waxless candle. Jesus, have you seen her recently? we used to live and die without any sense of the planet getting older, of mother earth getting older, living and dying. We used to live outside history. But now we're all coterminous. We're inside history now all right, on its leading edge, with the wind ripping past our ears. Hard to love, when you're bracing yourself for impact. And maybe love can't bear it either, and flees all planets when they reach this condition, when they get to the end of their twentieth centuries." 33. "She ate it and cried.Soon, he put the melting ice cream away. "Shura," Tatiana whispered, "darling, forget what should have been. Remember all that was. ""Tatiasha, babe," Alexander whispered, coming back to bed to be covered, "my one and only wife, forget our age, our splendid youth, forget it all and let our crazy love make us young." 34. "Poet of Nature, thou hast wept to knowThat things depart which never may return:Childhood and youth, friendship and love's first glow,Have fled like sweet dreams, leaving thee to mourn.These common woes I feel. One loss is mineWhich thou too feel'st, yet I alone deplore.Thou wert as a lone star, whose light did shineOn some frail bark in winter's midnight roar:Thou hast like to a rock-built refuge stoodAbove the blind and battling multitude:In honored poverty thy voice did weaveSongs consecrate to truth and liberty,--Deserting these, thou leavest me to grieve,Thus having been, that thou shouldst cease to be"
35. "How hard it is, to be forced to the conclusion that people should be, nine tenths of the time, left alone! - When there is that in me that longs for absolute commitment. One of the poem-ideas I had was that one could respect only the people who knew that cups had to be washed up and put away after drinking, and knew that a Monday of work follows a Sunday in the water meadows, and that old age with its distorting-mirror memories follows youth and its raw pleasures, but that it's quite impossible to love such people, for what we want in love is release from our beliefs, not confirmation in them. That is where the 'courage of love' comes in - to have the courage to commit yourself to something you don't believe, because it is what - for the moment, anyway - thrills your by its audacity. (Some of the phrasing of this is odd, but it would make a good poem if it had any words...)"
36. "...Grimacing, I plunged a hand into the fouled water to clear the clog, morbid curiosity drawing my youthful eyes to the gray globs of gore floating upon the surface. It was not horror that seized my imagination so much as wonder: sixty years of dreams and desires, hunger and hope, love and longing, blasted away in a single explosive instant, mind and brain. 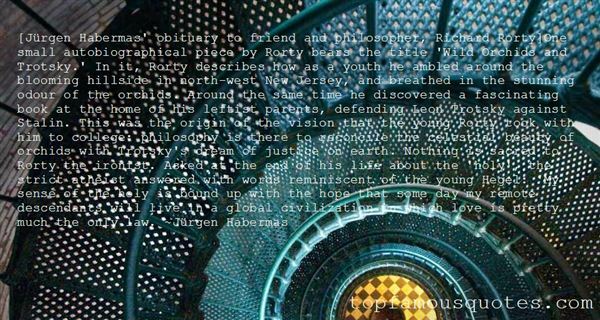 The mind of Erasmus Gray was gone; the remnants of its vessel floated, as light and insubstantial as popcorn, in the water. Which fluffy bit held your ambition, Erasmus Gray? Which speck your pride? Ah, how absurd the primping and preening of our race! Is it not the ultimate arrogance to believe we are more than is contained in our biology? What counterarguments may be put forth, what valid objections raised, to the claim of Ecclesiastes, "Vanity of vanities; all is vanity"?" 37. "Many people wake up in middle age with the realization that in their youthful romances and early marriages, they were drawn to precisely the kinds of partners they were trying to avoid. All too often we marry stand-ins for our alchoholic fathers, shadowy replacements for our angry mothers, surrogates with whom we try to work out our unfinished childhood dramas. Or we fall in love with someone who incarnates the virtues or vices opposite our own. An orderly man who plans his days marries a spontaneous woman who lets things lie where they fall, lives in the moment, and is perpetually late for appointments." 38. "I was exceedingly affected, says he, upon the occasion. But was ashamed to be surprised by her into such a fit of unmanly weakness-so ashamed that I was resolved to subdue it at the instant, and guard against the like for the future. Yet, at that moment, I more than half regretted that I could not permit her to enjoy a triumph which she so well deserved to glory in-her youth, her beauty, her artless innocence, and her manner, equally beyond comparison or description. But her indifference, Belford!-That she could resolve to sacrifice me to the malice of my enemies; and carry on the design in so clandestine a manner-yet love her, as I do, to frenzy!-revere her, as I do, to adoration!-These were the recollections with which I fortified my recreant heart against her-Yet, after all, if she persevere, she must conquer!-Coward, as she has made me, that never was a coward before!" 39. "We stare vacantly into our own future, frightened of all that time confiscates from us. We lament the theft of our beauty, youth, and loved-ones. And yet we somehow overlook the many ways in which we deprive ourselves: through anxiety and worry, we rob our hearts of peace and tranquility, as we sever the thin threads which tether us to the source of our creation." 40. "Our youth now love luxury. They have bad manners, contempt for authority; they show disrespect for their elders and love chatter in place of exercise; they no longer rise when elders enter the room; they contradict their parents, chatter before company; gobble up their food and tyrannize their teachers." 41. "There is a fountain of youth: it is your mind, your talents, the creativity you bring to your life and the lives of people you love. When you learn to tap this source, you will truly have defeated age." 42. "I was going to become a youth worker because I do voluntary work with the kids in the little village where I live. I make little films with them and stuff when I'm not working. I thought, I'll pack it in then, and go and do something I love doing, and get a regular job because I've got two kids and a mortgage." 43. "And I remembered now, too, my inadvertent youthful condescension, when the woman had said, apologizing for some information she couldn't recall, "I still remember the coat I wore when I was five, but I have no idea what I ate for breakfast today." I'd laughed and smiled in warm sympathy. How sweet, I had thought, she remembers her coat. She must have loved it not to have forgotten. But the coat wouldn't ask any effort of preservation. Feeling ninety, and no longer five, there would be the real effort. Telling that five-year old girl, in her beautiful coat, You're all finished. Submerged. Obsolete.We are ghosts of ourselves, and of others, and all of these ghosts appear perfectly real." 44. "He saw her as the passionate spirit of innocent youth, now beleaguered by the trick which is played on youth - the trick of treachery in the body, which turns flesh into green bones. Her stupid finery was not vulgar to him, but touching. The girl was still there, still appealing from behind the breaking barricade of rouge. She had made the brave protest: I will not be vanquished. Under the clumsy coquetry, the undignified clothes, there was the human cry for help. The young eyes were puzzled, saying: It is I, inside here - what have they done to me? I will not submit. Some part of her spirit knew that the powder was making a guy of her, and hated it, and tried to hold her lover with the eyes alone. They said: Don't look at all this. Look at me. I am still here, in the eyes. Look at me, here in the prison, and help me out. Another part said: I am not old, it is illusion. I am beautifully made-up. See, I will perform the movements of youth. I will defy the enormous army of age." 45. "Tear up that funeral shroud—you are going to smother yourself in it. I am beauty, I am youth, I am life—come to me, and together we will be Love itself....Our life together will flow by like a dream, and it will be as one perpetual kiss." 46. "It is not while beautyAnd youth are thine ownAnd thy cheeksUnprofaned by a tearThat the ferver and faithOf a soul can be knownTo which time will but Make thee more dearNo the heart that has truly lovedNever forgetsBut as truly lovesOn to the closeAs the sunflower turnsOn her god when he setsThe same look whichShe'd turned when he rose." 47. "We danced our youth in a dreamed of city, Venice, paradise, proud and pretty, We lived for love and lust and beauty, Pleasure then our only duty. Floating them twixt heaven and Earth And drank on plenties blessed mirth We thought ourselves eternal then, Our glory sealed by God's own pen. But paradise, we found is always frail, Against man's fear will always fail." 48. "There are few men who do not look back in secret to some period of their youth, at which a sincere and early affection was repulsed, or betrayed, or became abortive through opposing circumstances. It is these little passages of secret history, which leave a tinge of romance in every bosom, scarce permitting us, even in the most busy or advanced period of life, to listen with total indifference to a tale of true love." 49. "With the arrogance of youth, I determined to do no less than to transform the world with Beauty. If I have succeeded in some small way, if only in one small corner of the world, amongst the men and women I love, then I shall count myself blessed, and blessed, and blessed, and the work goes on." 50. "Where wasteful Time debateth with decayTo change your day of youth to sullied night,And all in war with Time for love of you,As he takes from you, I engraft you new"
Even if lives did hang in the balance, it would depend on whose they were."